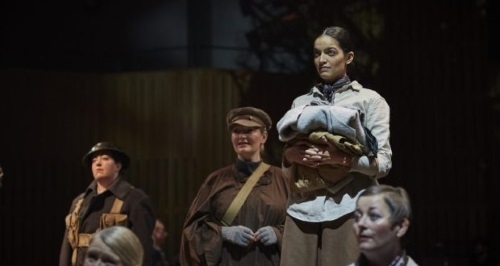 This is just a brief note to say how much I enjoyed Not Such Quiet Girls… presented by Opera North in the Howard Assembly rooms in Leeds last week. The script, by Jessie Buckley, takes inspiration, and sometimes lines and episodes from Evadne Price (alias Helen Zenna Smith) Radclyffe Hall and others to make a play about women ambulance drivers on the Western Front. The story is fairly slight, but made enjoyable by two things. First, the acting is good. Second, and most important, the music is marvellous. The all-female cast comes from the chorus of Opera North; this chorus has previously created two shows that I enjoyed immensely – two years ago a production of Sondheim’s Into the Woods, set in a primary school,and earlier this year an evening of Kurt Weill’s Berlin andBroadway songs. Both those shows were first-rate, and this one was not too far behind. In Not Such Quiet Girls, the action was interleaved with songs of the period, some of them art songs, others from the music hall. My favourite was the Marie Lloyd number ‘Now You’ve got your Khaki on’, delivered with all the approprite suggestiveness. But they’ve took it off, and stuff’d it in yer chest. But I do like yer, cocky, now you’ve got yer Khaki on. An interesting thing this show was that it used the Great War not for a pacifist message (though it left no doubt that the war was bloody awful), but as a background for a personal story, for which the war was a catalyst, but not a cause. I think this is what is happening to Great War fictions these days, as the the futility-of-war theme that dominated before the centenary becomes to look a little obvious, and as the war recedes further into history. Opera North is also presenting Silent Night, though, an opera about the Christmas Truce. I didn’t fancy that, though on the showing of this piece, they’ll probably do it well. This entry was written by George Simmers and posted on December 2, 2018 at 3:53 pm and filed under novels with tags Evadne Price, Marie Lloyd, Not Such Quiet Girls, Opera North, Radclyffe Hall. Bookmark the permalink. Follow any comments here with the RSS feed for this post. Post a comment or leave a trackback: Trackback URL.